It’s the start of the new year and about all I’ve been able to do in 2018 is dream about fishing. I did get a good throw on Washington’s Bogachiel River in late December, but that was it. And, it rained over an inch on my head in the six hours I spent on the water. Still, I loved every huck, even though none connected with steelhead. So, I’ve been planning out the year and hoping to retrace some bootsteps in ’18. One of the places on my hitlist is Salmon Lodge and Bonaventure Lodge on Canada’s Gaspe Peninsula. I want to get back at some Atlantic salmon, and try to connect with some bright fish. In the past, I’ve visited in September when the numbers are high but the chrome-bright factor is low. No complaining. A fish is a fish and an Atlantic on a swung fly is a treasure. That’s how I feel about the fish you’ll see here. Worked a run hard, rose the fish once, and swung him up after a short rest. I like the emotion in the first image and hope you can relate. The second image, of course, is the classic grip and grin and what makes it great is the enthusiasm the guide displays. He’s as happy as me and that’s all you can ask from any guide. The third image depicts those moments after the catch when you can say, I got one and anything after this is gravy. Why not celebrate with one of the guide’s cigars and a belt of a bottle of Johnny Walker. 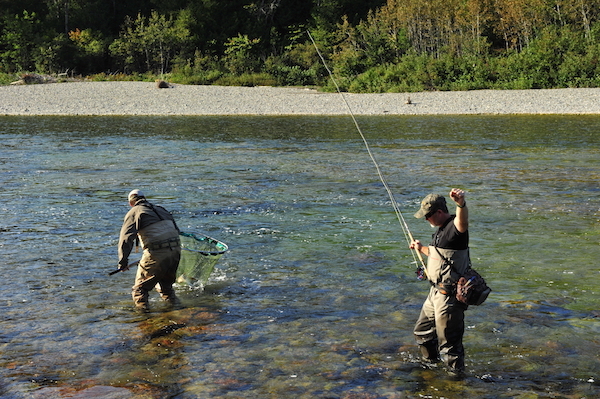 Life is to short, and Atlantic salmon in too short of supply, not to go big. By the way, shortly after our celebration I waded back in and stuck another. Yes, Canada’s Atlantic salmon in 2018, on the Gaspe, fly fishing with a spey rod. I’m in. 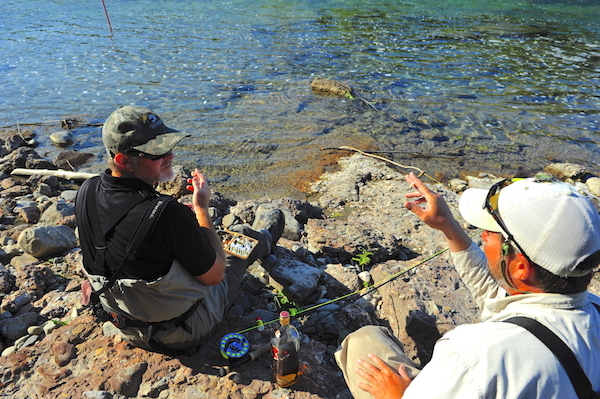 This is a great moment in fly fishing, when an angler and guide taste success, admire a fish, and send it back for another angler to catch some day. Celebrating the right way, with a guide’s cigar and a belt of Johnny Walker Red. 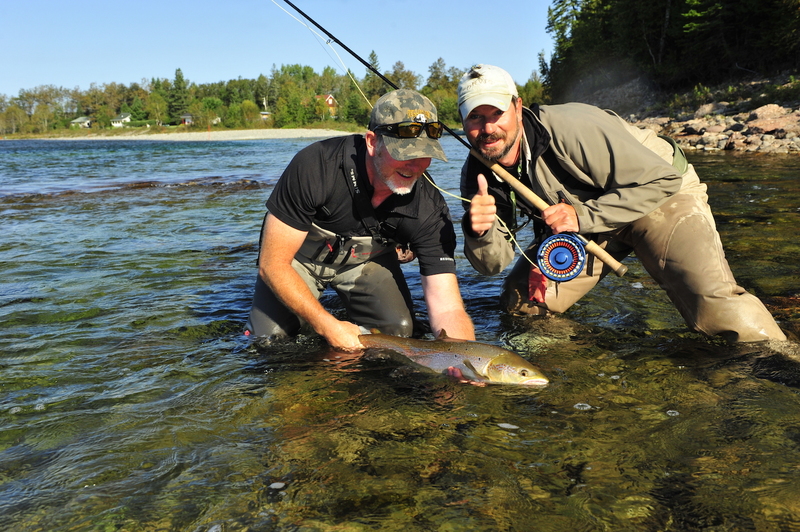 This entry was posted in CANADA, Spey, Travel and tagged eastern Canada Atlantic salmon, Gaspe Peninsula, Spey rods. Bookmark the permalink.